We really like “international weddings”! Veronique is from Venezuela, Mateo from Mexico, but they live in Switzerland. However, they decided to get married in Langhe, and to have the wedding party in luxury Boscareto Hotel; we enjoyed it so much! We started in early afternoon, when we went at the hotel, in the room where Matteo was dressing. From his bright room we could look at the beautiful landscape on the vineyards of the country. With him, there was his brother and the little nephew too, all cheerful and relaxed. Then we moved to Veronique’s, who was busy with make-up and dressing, with her mom, two granddaughters and some friends. While we were taking a lot of photos, with reflections and silhouettes, we noticed the wonderful “vintage” wedding rings pillow, used by her aunt many years ago. A lot of guests came to attend the wedding from the center/south America and from Europe, filling the municipal hall of Serralunga d’Alba with their various languages and inflections. Part of Veronique’s family is from Italy, so the celebration was officiated in italian… but it’s the same, because “sì” is a word known by people of all the world! Maybe because of the variety of inflections, or the petals dance at the exit of the just married young couple, or the sun that was shining in a bright saturday after a rainy week, maybe because of all these things, there was a very nice atmosphere, that went on for the whole party. 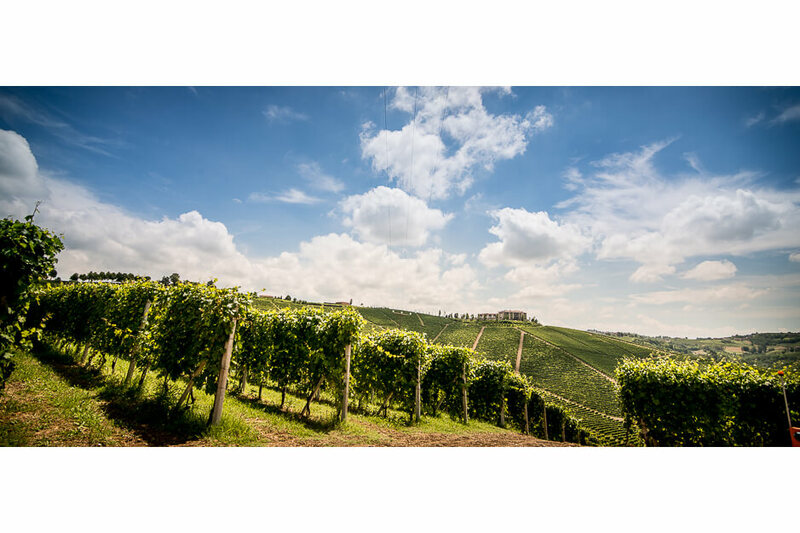 The Boscareto restaurant is surrounded by amazing Langhe’s hills and vineyards: we loved to take photos all day long, and during the dusk too, with its magnificent colours; also in the evening we took beautiful shots with the dark-blue colour of the sky that introduces night hours. Group shots, throwing of the bouquet, toasts, wishes, cutting of the wedding cake on the roof, we really did everything, and we ate very well! It was a super party, with music, dance, amusing projections and masks… Thanks Veronique and Mateo for the beautiful day and the beautiful night!